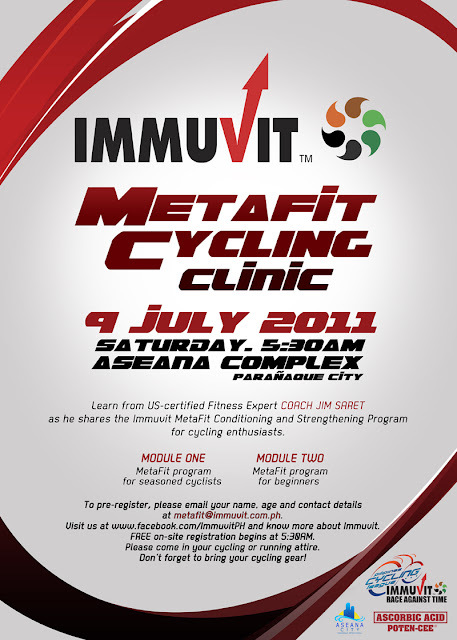 Immuvit presents Metafit Cycling Clinic to be conducted by US-trained Fitness Expert Coach Jim Saret, who is also one of the resident trainers in Biggest Loser (Pinoy Edition) currently showing on ABS-CBN Channel 2. This will be held on July 9, 2011 at 5:30am at the Aseana Complex along Macapagal Road in Parañaque City. This program is open to cyclists & runners, including cycling & running enthusiasts.